I wouldn’t call myself a photographer. I like taking photos, especially when I’m travelling. I’ve invested in better lenses and somehow picked up so many random accessories.I can see improvement over time from when I first started taking photos to now, but I wouldn’t say I’m a photographer. It’s just a hobby for me and there are tons of people just like me. All you need to do is take a quick browse through Instagram (and follow me on there if you haven’t already) to spot them. I hate camera bags that scream they’re a camera bag. I’ve been want to get myself a purse camera bag in a cute colour to tote around. There are tons of messenger bag options, but I’ve been after ones with a little more style. If I were to splurge one year, I’d go with one of these options from Jo Totes or Kelly Moore. I recently bought this padded camera insert for my purse for my trip to Berlin and I love it. It’s a bit snug for my camera with a 24 – 70 mm lens and a spare 10 – 20 mm, but it worked well. I was able to use my regular purse and no one was the wiser about what was in my bag until I took out my camera. It’s a more affordable option to one of the stylish camera bags above. If you don’t need as much structure and just want to protect your camera, one of these neoprene cases works amazingly well. I used one of these for years before I started carrying a second lens with me on my travels. You can get it in plain black or one of these funky patterns. One of these carbon fibre tripods has been on my wishlist for years. Being made from carbon fibre makes it significantly lighter than a regular tripod. I have heard great things about the MeFoto Globetrotter Travel Tripod and the Manfrotto Befree Carbon Fiber Tripod. However, there are lots of different things to consider when picking out a tripod and this guide is helpful. This flexible tripod is a good option for someone who may not want to travel with a standard sized tripod, but still want the stability that a tripod offers. This is usually my go-to when I bring a tripod on my travels. I love the fact that you can bend its legs into whatever position you need to hold up your camera. They also have different options depending on the camera with ones for DSLR, point and shoot, and mirrorless cameras. A lot of cameras these days come with built-in wifi capabilities so you can post directly to social media or backup online. However, if you have a camera that doesn’t have this capability like I do, a wifi enabled memory card works wonders. Any memory cards, in general, are a welcomed gift. You can never have enough memory cards, especially when on the road. Running out of room is the worse (which I know from personal experience!). With so many sales on for the holiday season and digital storage getting cheaper and cheaper each year, this makes a great stocking stuffer. Pair your cards with a memory card carrying case to help your traveller stay organized. One of my first lens that I bought was a 55 mm f/1.8 lens from Nikon. It was relatively inexpensive when it comes to lenses and it allowed me to get a little more creative when working with depth of field and to take better quality photos in low light. However, because my camera has a crop sensor (as opposed to full frame), I wish I had gotten the 35 mm f/1.8 lens instead to allow for the crop effect. For a better explanation of why this is important, read this. They say the best camera you have is the one you have with you. If you’re anything like me, for most people, that’ll be your phone camera, but the built-in lens may not necessarily give you the shots that you want. Pick up a set of lenses for your phone to expand the range of your phone. I was gifted this set from VicTsing and while I haven’t had a chance to take them travelling with me, using it at home has produced some nice results. Draw less attention to the brand of the camera and add some personality by switching out the straps of your camera with a new camera strap. I like the patterns of this one, but there are lots of options out there. Keep fingers warm during the winter months. These from Freehands are a good option which allows movements of fingers in the glove and when needed you can fold back the fingertips to use your phone or any other touchscreens. Alternatively, you can get gloves that are built for touchscreens, however, I’m not a big fan of these gloves as I find I just don’t have the dexterity I want. I originally bought one of these remote releases for some food photography that I was doing for work. However, I’ve since started taking it with me on my travels. It’s small enough to slip into my bag without much bulk and weight added, but it gives me the flexibility to take photos of myself. 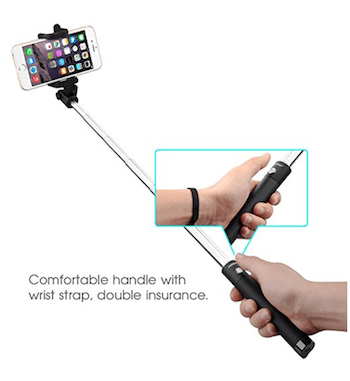 I can hold up my camera selfie style and snap if my lens is wide enough or set it on something to take a photo – the cord still gives you extra room to work with. My camera doesn’t do wifi, but if your giftee has this capability in his or her camera, get a wireless one. For those who like to partake in water adventures while travelling, a dry bag is a necessity. Give them peace of mind to have fun while their electronics and camera gear stay dry. Pick up a separate case for the phone which allows use through the protective plastic. Say what you will about selfie sticks, but when travelling on your own, they’re so useful in grabbing a quick photo of yourself without needing to ask someone to take a photo of you. What to do with all the photos taken on trips? Share them of course! SmugMug is a great option allowing you to create a website and display photos in an elegant environment. There are numerous plans that you can gift. I love Lightroom. It is the perfect extension to help make photos look like how you imagined it or saw in real life. 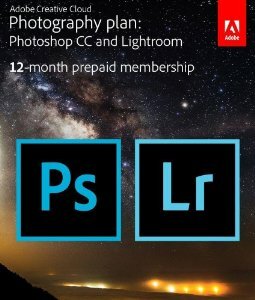 This photography combo from Adobe gives you access to both Lightroom and Photoshop which is all you really need if you like to take photos. 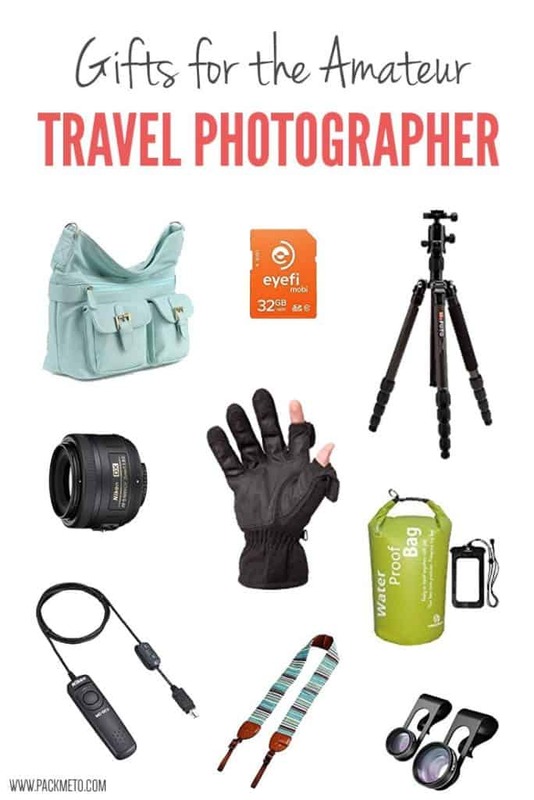 So there you have it, my top picks of gifts to give your travelling friends who enjoy taking photos. Is there anything I missed? Let me know in the comments your favourite things to make your photos pop. P.S. Need more travel gift ideas? Here are 10 Holiday Gift Ideas for Travellers (for $50 or less) & The Pack Me To Holiday Gift Guide For Travelers. Note: A few of these links are affiliate links which means if you click on them and make a purchase, I will earn a small commission at no additional cost to you. My boyfriend is a traveler and he also loves to take photos. from many days, I wanted to give him a gift which one is useful for him. but I was confused which gift I selected for him. this article helps me much to decide which gift I will give him.Now I want to give him a camera bag and an eye-fi card. I also want to thank the author of the article for this helpful article.